You are in need of the perfect pair of duty boots, and these are in need for the perfect pair of feet. It's like a match made in happy-feet heaven. They are extremely tough without being heavy, and they're completely waterproof. Plus, they are uniquely built for fe ... (see full details) (see specifications) #55315. You are in need of the perfect pair of duty boots, and these are in need for the perfect pair of feet. It's like a match made in happy-feet heaven. They are extremely tough without being heavy, and they're completely waterproof. Plus, they are uniquely built for feet that consistently find themselves crossing different types of terrain. These men's Danner sage green boots are waterproof. 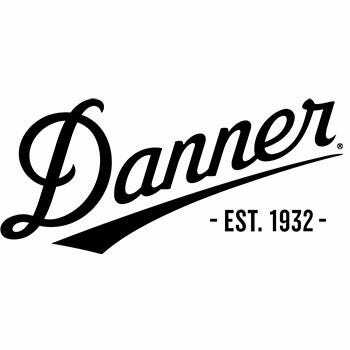 They are made with Danner's Danner Dry Liner technology. The liner is a 100 percent waterproof barrier between your foot and any outside liquid. It's great because it allows moisture such as sweat to escape the boot without letting external wetness in. While wearing these men's composite toe boots, your feet will be dry, fresh, and comfortable throughout the entirety of each and every wear. In addition to being able to keep your feet dry from the inside out, these men's duty boots offer excellent grip across a variety of terrains. They are made with a hardy Danner Tanicus outsole, which features pentagonal lugs that give the maximum surface contact for the best possible grip. The durable outsole that is built to increase traction is mirrored in strength by the uppers. The uppers on these men's waterproof boots are made from full-grain leather in the color sage green. The leather is super tough, and it is paired with 1000 Denier nylon for superior protection. Speaking of protection, these men's lace-up boots have it in the form of a composite toe. The composite toe is lighter than steel toes without sacrificing the ability to keep you safe. Plus, their non-metallic nature makes going through metal detectors a breeze. The composite toe also meets the requirements for the safety standard ASTM F2413-11 I/75 C/75. Essentially, they can prevent harm to your toes in the event of drop impact or compression. The previously mentioned Tanicus outsole is also rated according to the ASTM safety standard for electrical hazard resistance. It can keep you safe in the event of contact with an open electrical circuit. Overall, these men's leather boots have a rating of ASTM F2413-11 M I/75 C/75 EH. Lastly, these men's non-metallic boots are made with convenient, secure lace-up closure. The eight-inch shaft features a lace garage, which prevents loose laces from snagging or dragging. The top of the boot's tongue has a stretch fabric pocket that is made for tucking laces into. It may sound like an insignificant inclusion compared to the composite toe or the waterproof liner, but being able to tuck away the laces on these men's electrical hazard boots means loose laces won't become a nuisance or a hazard. Your feet need boots made specifically for them, and these Danner Boots Tanicus Men's Composite Toe EH 55315 Sage Green Duty Boots need feet to please. Give them yours, and you surely won’t regret it. I love these Danner boots. They took a couple of days to break in but they are pretty comfy for a combat boot. They have good support but if you have high arches like me I’d recommend putting some kind of additional support or orthotic in there. I bought these anticipating something that would last longer than my boots typically had as I am pretty rough on my footwear and so far so good. I am often ankle deep in wet grass and mud puddles and these things will keep you dry. The only negative is that these are things will cook your feet but I still gave 5 stars as that comes with the territory wearing a steel toe combat boot. Danner Boots: Tanicus Men's Composite Toe EH 55315 Sage Green Duty Boots is being added to your cart.